I’ve been trying to work up some excitement about the upcoming Super Bowl and failing rather miserably at it. It’s really not all that fun if you don’t have a team to root for, and it’s nearly impossible if you’re sort of rooting for both teams to lose. I’m still mad at the Seahawks for beating our beloved Packers (I should be mad at the Packers for losing that one, but for now, I’ll just channel my misdirected anger towards the Seahawks), and I’m not much of a Patriots fan, especially now with the whole deflate-gate scandal, which I don’t know, I can’t even get all that worked up about that either. But, it’s an event, and it’s an event with food, so I’ll be there. With wings. Curious imagery aside, I’m not in the least apologetic for going wings for the super bowl, even though it seems so cliché. 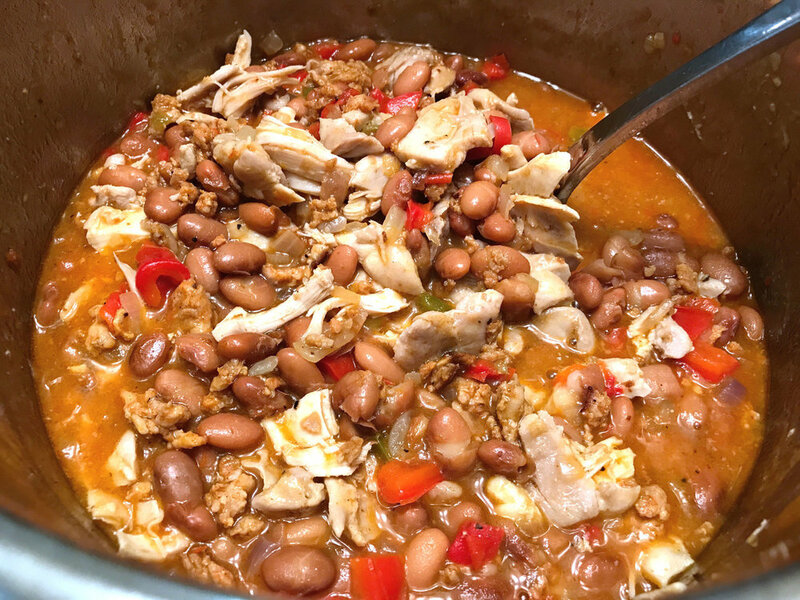 There are just some things you don’t mess with and iconic super bowl foods fall squarely into that category… nachos, sliders, chips, dips and wings. 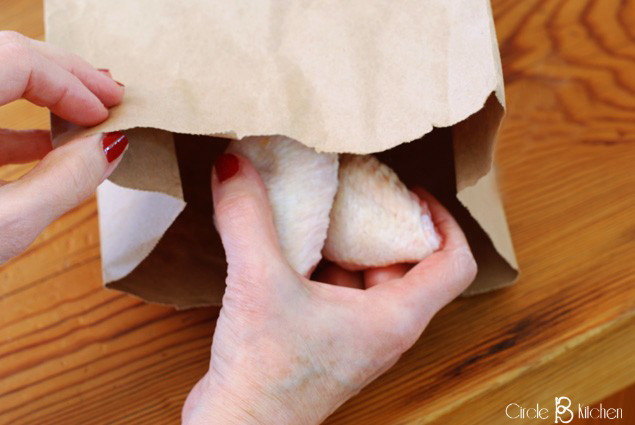 It’s like turkey at Thanksgiving, burgers on the 4th and eggs at Easter… you don’t mess with tradition, right? 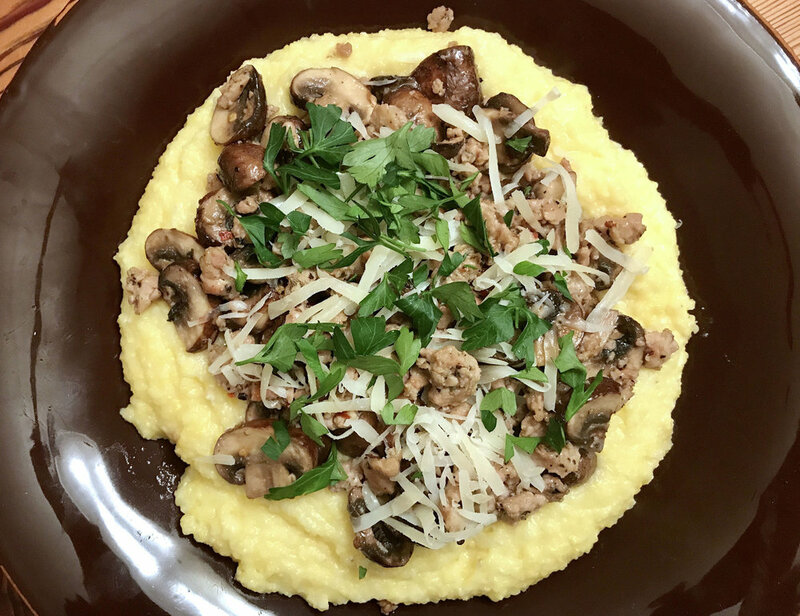 Well, actually, one might claim a bit of latitude when it comes to super bowl party food, and we usually have a fairly odd mix of new and old favorites. 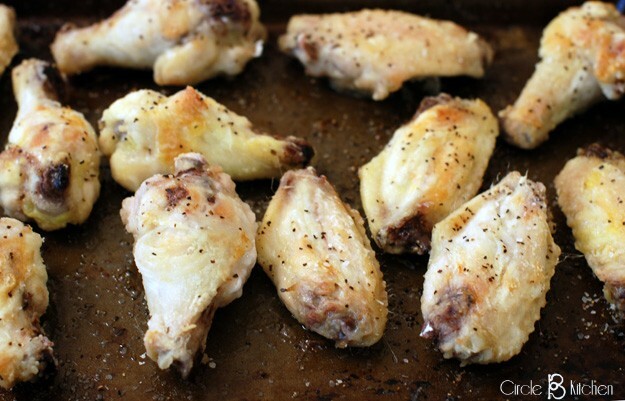 But for the purposes of our discussion here, we’re sticking with the traditional, and that means wings. 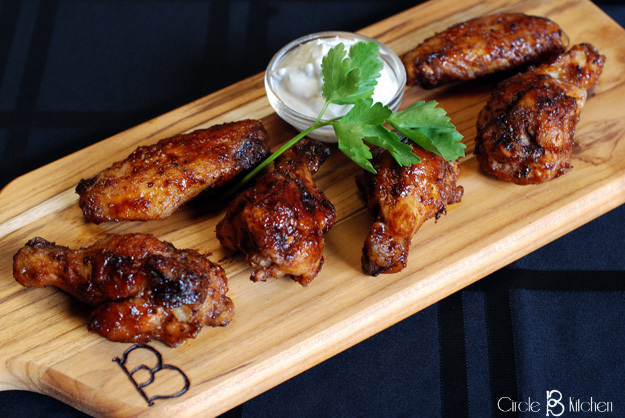 These have been our go-to wings for a few years now, so I think it’s high time I shared them with you on the off chance that you’re still in the planning stages of your super bowl fete. Then, if you cut over there at that other bent part, you can cut off the little tip (and save those little ends for stock or something). 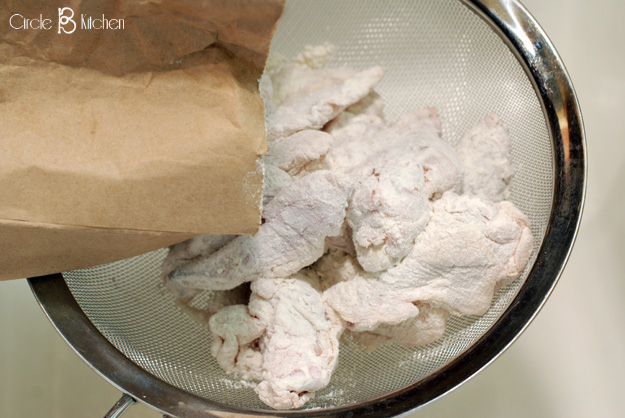 Throw in your wings, shake em up good and then dump it all into a strainer and shake again to remove the excess flour. And then into the oven for about 30 minutes, turning once if you want. 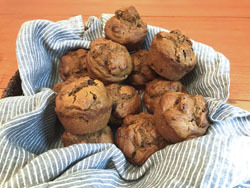 Honestly, I just wanted to eat them right there like that straight out of the oven and I’m going to do that someday, but not today. 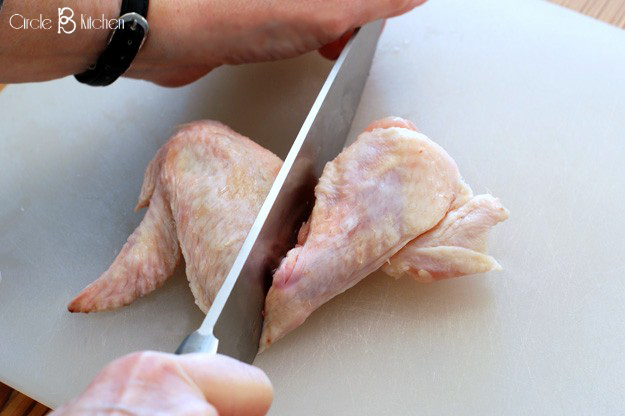 These wings need sauce! 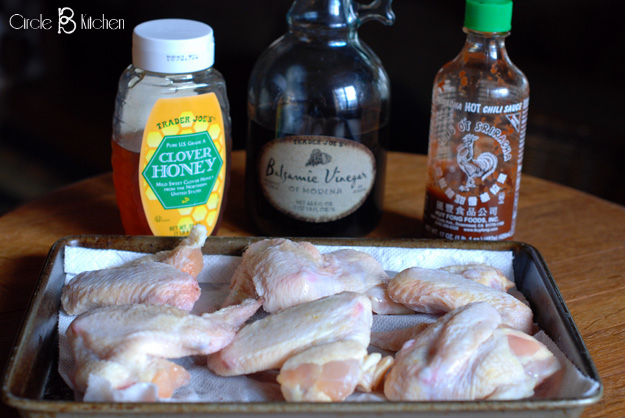 So we're going to mix up the sauce ingredients - balsamic vinegar, honey and sriracha. Originally, the recipe called for 1/4 cup of sriracha sauce, and if you enjoy setting your hair on fire, go ahead and add the full amount. 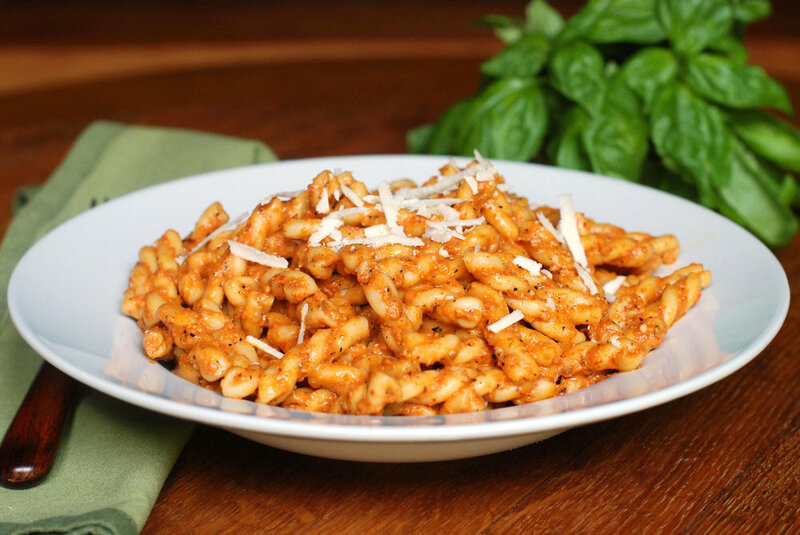 I've knocked it back to 2 tablespoons which seems spicy enough without having to stick your head under a faucet. 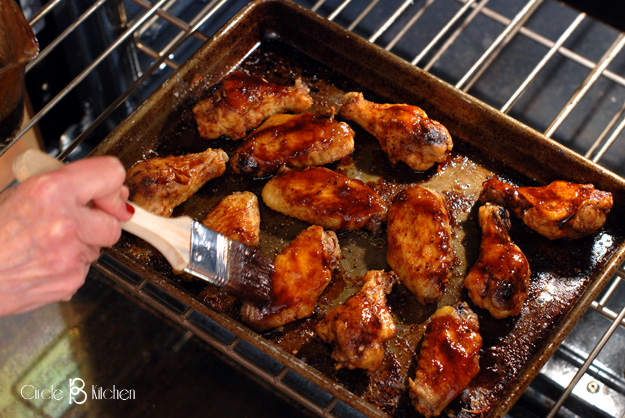 The wings then get thoroughly coated with this wondrous sauce then back they go into the oven to finish baking and getting all caramelized, a little crispy and totally luscious. You don’t actually need to dip these in anything, but a nice blue cheese or ranch dip is traditional and delicious, so you might consider that a possibility. 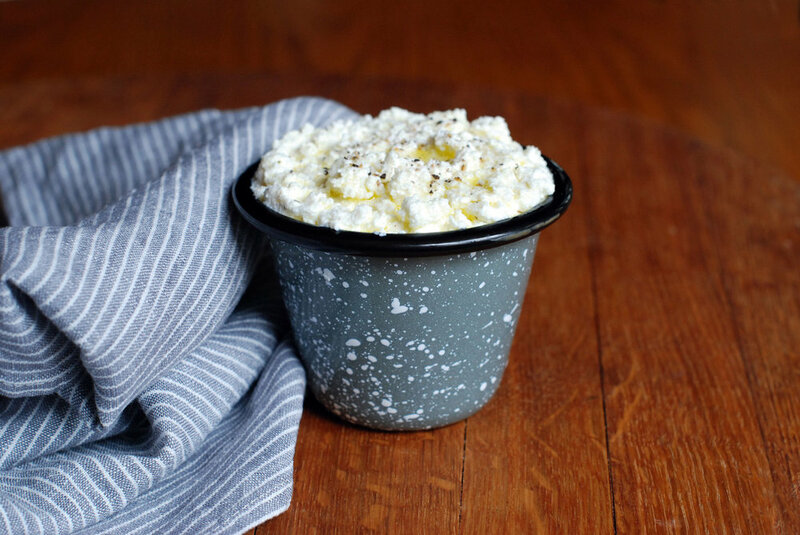 I like to combine some of my yogurt cheese with a little ranch dressing and softened goat cheese and that makes a pretty killer dip too. 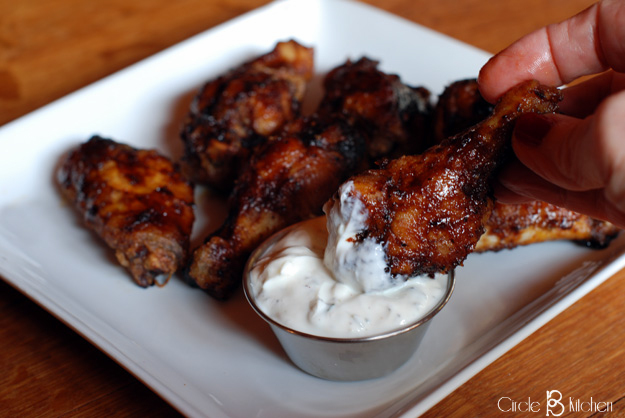 I have to say, it helps cut through my super bowl ambivalence a little to be throwing together some good eats, and these wings will no doubt brighten the mood. Preheat the oven to 400 degrees. 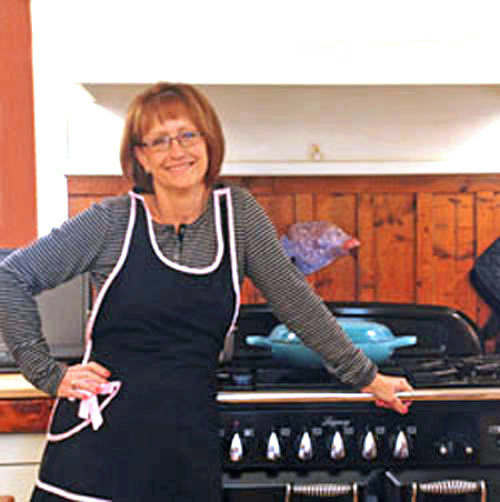 Spray a baking sheet with Pam. 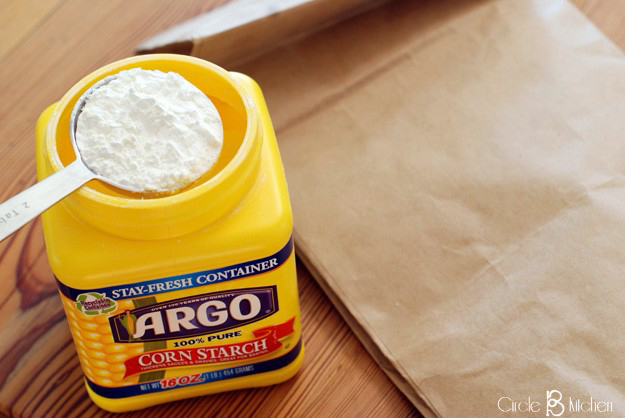 Place about 1/3 cup flour and 2 tablespoons of cornstarch in a paper bag. Shake to combine. Add the wings and shake to completely coat. 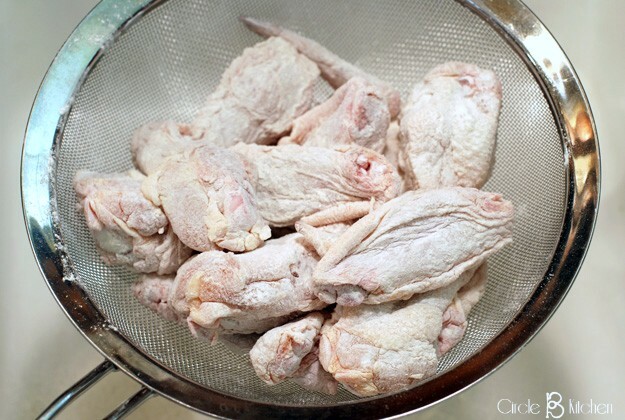 Dump the wings into a wire mesh strainer and shake off all of the excess flour. 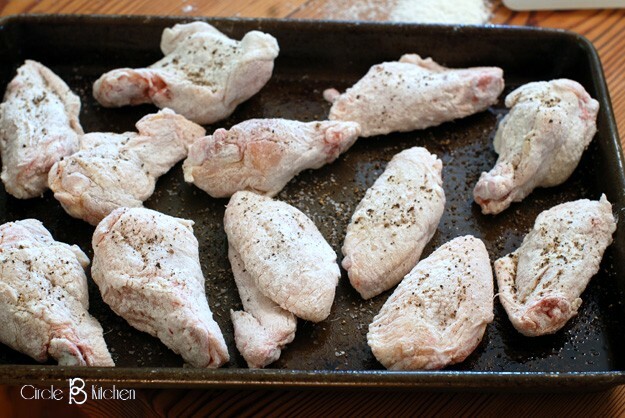 Place the wings on the prepared baking sheet and sprinkle with salt and pepper. 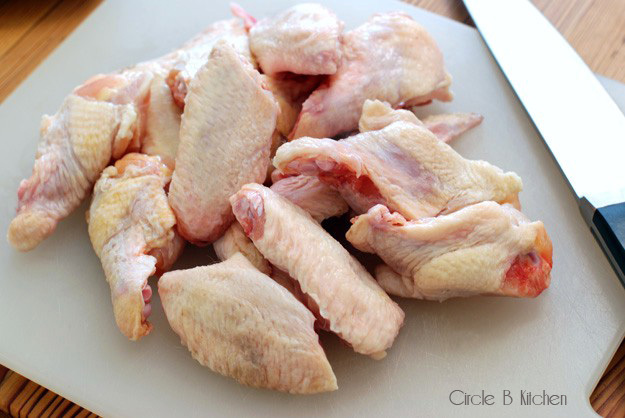 Bake the wings for 15 minutes and then turn them and sprinkle with more salt. 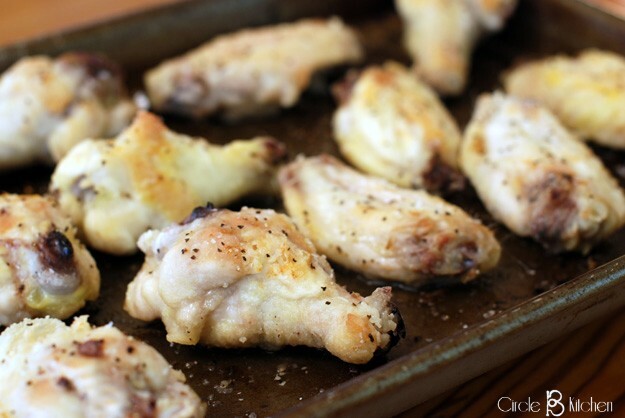 Return the wings to the oven for another 15 minutes. 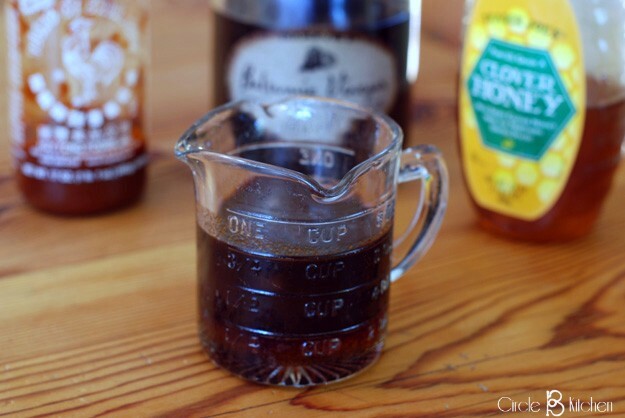 Meanwhile, combine the balsamic vinegar, honey and sriracha sauce. 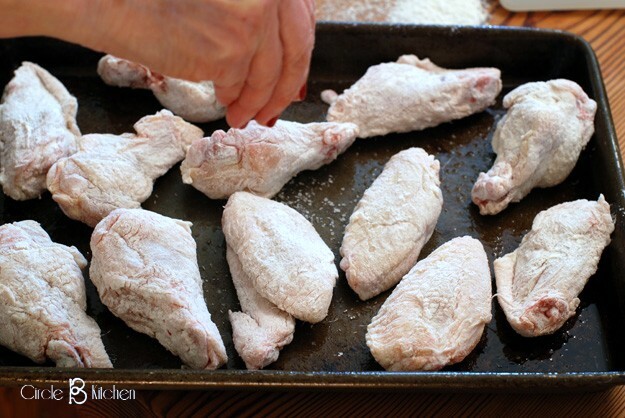 Remove the wings from the oven and place in a large bowl. 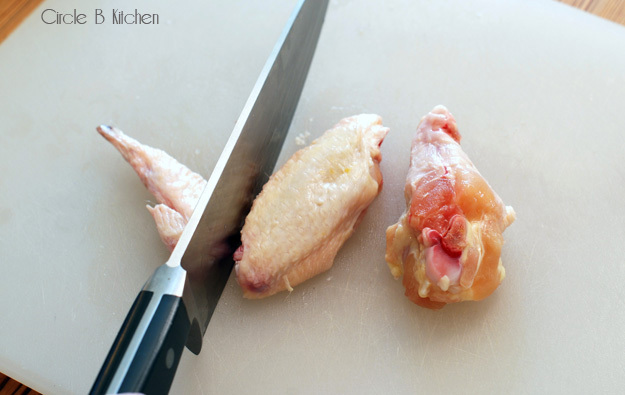 Pour most of the sauce over the wings to coat well and place them back on the baking sheet. Bake for about 15 or 20 more minutes, turning and basting until they’re dark and the sauce has caramelized. 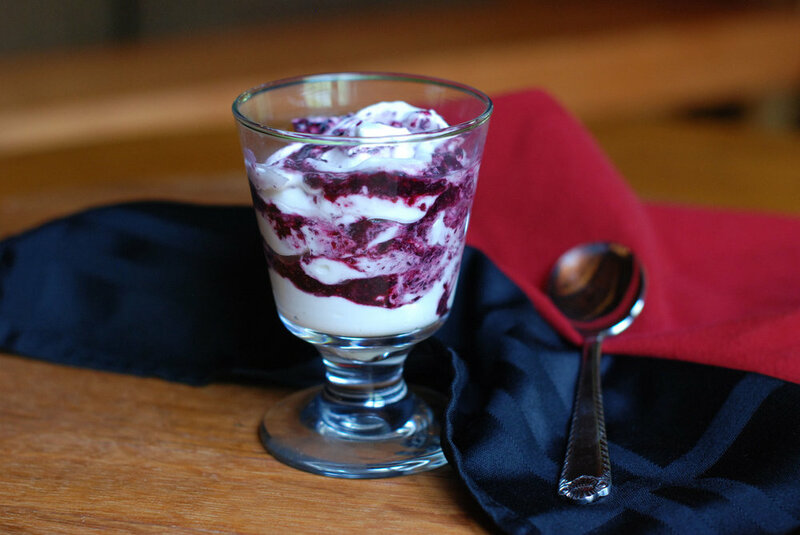 Serve warm or room temperature with the dip of your choice.